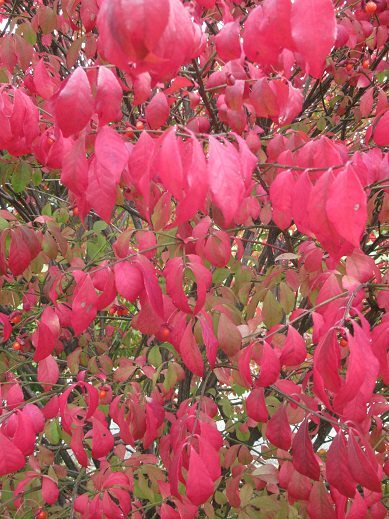 There is no bush that flags the autumn and calls attention to the fiery colors of season like Euonymus alata, the Burning Bush. 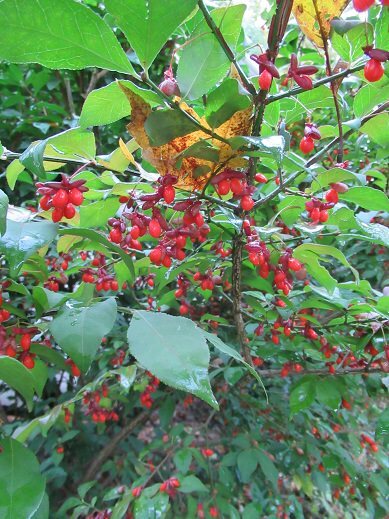 Even though the Burning Bush is outlawed from planting, selling, or importing in Massachusetts it is the sight that heralds in fall here in New England, and that is why I have named Euonymus alata, Burning Bush the plant of the week. The self-propagating characteristics of this deciduous shrub are the traits that put it on the invasive plant list in numerous states. The Burning Bush can spread through the undergrowth of the mother plant pushing up suckers from the extensive, sprawling root system, the tiny suckers will grow and reach for light if not kept in-check and removed on a regular maintenance basis. The above feature is one of the reasons the Burning Bush was widely planted with new construction during the 1950s through the 1960s, the root system quickly spreads and keeps soil from eroding. Burning Bush was also mass planted along highways to control water and erosion, the plant adapts to just about all types of soil, boggy being the least favorable but it will still grow but weakly. 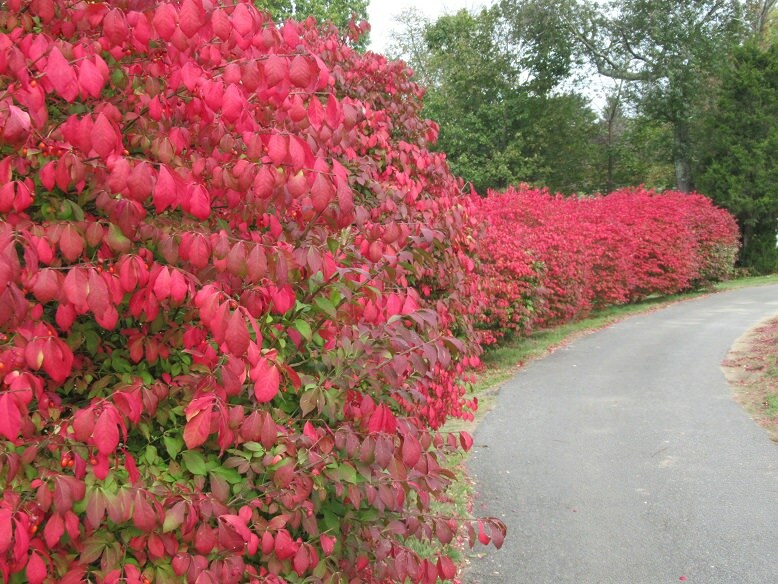 The Burning Bush will also adapt to the shade but becomes a bit boring; it is the direct sun plantings that dictates the brilliant colors of the leaves during the fall….the more sun the more spectacular the color display will be. The fall also brings bright red berries on the Burning Bush; the berries are enjoyed by birds and small mammals but are toxic to humans and livestock. The seeds within the berries are consumed by birds, who then fly to other locations and excrete the seeds randomly, causing invasive undergrowth on forest and woodland floors. Burning Bushes that were planted back in the day (before banning) for home landscape purposes can reach heights of eight to ten feet tall and just as wide if left to grow unmanaged; in most cases, homeowners prune Burning Bushes into manageable balls or squares around foundations. Some specimen Burning Bush plants sprawl tall and wide creating dense branching providing protected homes for our winged friends. It is noted that the branches of the Burning bush are called winged stems, the square wooden branches of the fiery euonymus have ridges that protrude out a bit allowing snow to settle on the branches offering great detail after a winters snow, it really is a beautiful, truly loved New England bush. New cultivars and varieties of the Burning Bush have been developed but it seems form data I have read that the original characteristics come through even the dwarf varieties. Burning Bushes are still being requested by customers at the Boston, Ma. Home Depot that I work in and when I tell customers that they are not available for sale in Massachusetts they are always surprised. I grew up with seeing Burning Bushes in the landscape, in parks, planted outside municipal buildings, golf courses and along the Charles River in Boston. 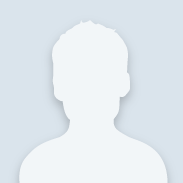 My hope is that a perfect Burning Bush specimen will be developed and be safe to plant, but for now, I will enjoy the sight of the beautiful outlaw. 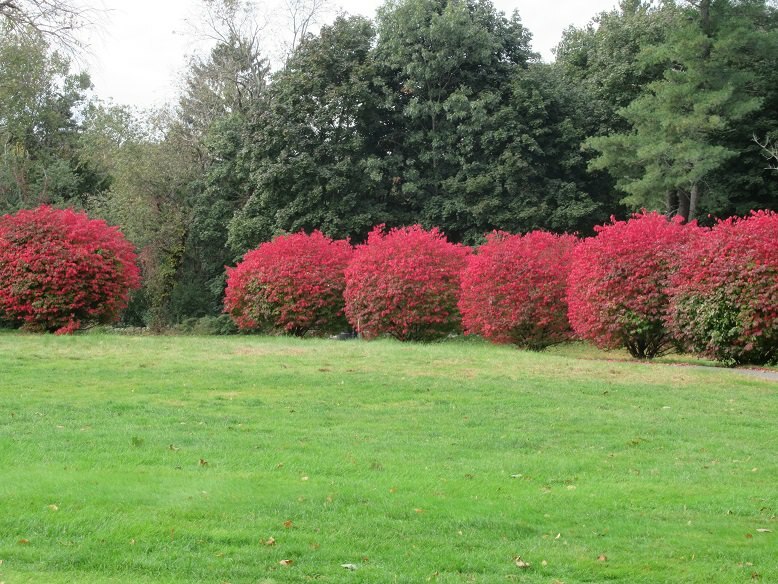 If you have a Burning Bush in your landscape take care to maintain it, prune the berries off and discard the cuttings in the thrash not a compost pile or a wooded area, remove suckers, keep it polite and revel in its color for someday it will may be gone forever.